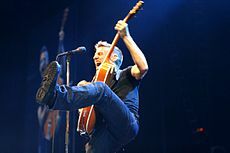 Bryan Adams is a Canadian singer-songwriter and guitarist. He has been nominated for 13 Grammy Awards, and has won two. He has also received awards and nominations at the American Music Awards, MTV Video Music Awards, and Golden Globe Awards. His work on the Robin Hood: Prince of Thieves soundtrack won him two awards at the 34th Grammy Awards, including "Best Pop Instrumental Performance" and "Best Song Written for a Motion Picture, Television or Other Visual Media". He also collaborated with Sting and Rod Stewart in 1995 for the single entitled "All for Love", which received a Grammy nomination that same year. Overall, Adams has received four awards from 4 nominations. Adams was awarded the Order of Canada and the Order of British Columbia for his contribution to popular music and his philanthropic work. He was also inducted into Canada's Walk of Fame in 1998. In April 2006 he was inducted into the Music Hall of Fame at Canada's Juno Award, and in 2007 he was nominated for his fifth Golden Globe for the song "Never Gonna Break My Faith" which appeared on the soundtrack for the movie Bobby. The American Music Awards (AMA) are awarded for achievements in the record industry. Adams has won one AMA, and been nominated for three. The Grammy Awards are awarded annually by the National Academy of Recording Arts and Sciences of the United States. Adams has won two Grammys and been nominated for thirteen. The Juno Awards are presented annually to Canadian musical artists and bands to acknowledge their artistic and technical achievements in all aspects of music. Adams has won eighteen awards out of fifty-five nominations. The MTV Video Music Awards is an annual awards ceremony established in 1984 by MTV. Adams has been nominated ten times and has received one award. The Golden Globe Awards are awarded for achievements in the record industry. Adams has been nominated for five Golden Globe. The Academy Awards, popularly known as the Oscars, are awards of merit presented annually by the Academy of Motion Picture Arts and Sciences (AMPAS) to recognize excellence of professionals in the film industry, including directors, actors, and writers. The formal ceremony at which the awards are presented is among the oldest, prestigious, and most watched film award ceremony in the world. Adams has been nominated three times but has never won. Adams has been awarded three honours. ↑ "Bryan Adams receives the Order of Canada". gg.ca. 1986-09-05. Retrieved 2008-09-01. ↑ "O.B.C. Biography - Bryan Adams". protocol.gov.bc.ca. 1986-09-05. Retrieved 2008-09-01. ↑ "Canada's Walk of Fame". Canada's Walk of Fame. Retrieved 2008-09-01. ↑ Pareles, Jon (1992-01-02). "Grammy Short List: Many For a Few". New York Times. Retrieved 2008-09-01. ↑ "Grammy's Gold Rush". Entertainment Weekly. 1992-01-02. Retrieved 2008-09-01. ↑ "No Clear Oscar Favorite Emerges From the 2003 Golden Globes". About.com. 2006-12-14. Retrieved 2008-09-01. ↑ 10.0 10.1 10.2 "About the Academy Awards". Academy of Motion Picture Arts and Sciences. Retrieved 2007-04-13. This page was last changed on 31 August 2017, at 06:42.